Natural remedies for asthma have been used by many asthmatics, successfully enough to reduce or eliminate their use of prescription inhalers. The medicine in asthma inhalers cause irritating side effects like nervousness and shaking, sore, dry throat, mood and emotional imbalance, as well as spike in blood pressure. Long term use can cause other serious problems that aren't as noticeable until they have caused much damage. Cataracts, growth problems, adrenal suppression, and osteoporosis among them. The cost of asthma medicine is also why people turn to natural asthma remedies. Patient co-pays can be as low as $5.00 or as high as $60.00 for one inhaler. A study from The American journal of Managed Care found costs increased on average $9.00 a month for asthma medicine from 2005-2006. Medical costs have continued to increase since then with drastic changes in the medical health care insurance industry. You may have already experienced how life-threatening asthma conditions can be. A college friend of mine got news that her mother died while driving herself to the hospital during an asthma attack. Another friend told me she saved her sons life more than once through CPR during asthma attacks. Roughly 25 million Americans have asthma and about 3500 of those die from asthma each year. 60% of asthma deaths in the U.S. are people 65 years old or older. 5% of asthma fatalities are children. 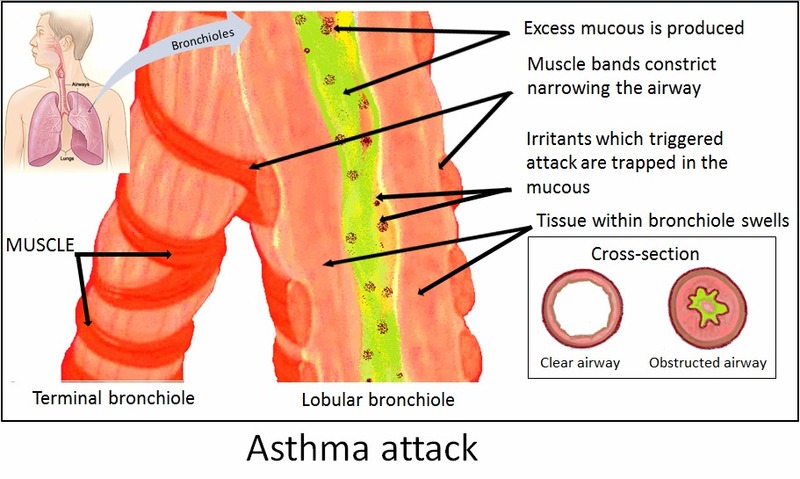 The picture below shows what happens when a person has an asthma attack. The lining in the bronchial tube swells when triggered, limiting air flow to the lungs. As you may already know,the serious nature of asthma is why people can't afford to ignore the symptoms. Although there is no medical cure for the disease, it can be managed. Most people do it through prescription medicine and doctors visits. Most of this medical treatment will help reduce the often debilitating and potentially fatal reactions to asthma triggers, but it doesn't take away the root cause of the problem. The serious side effects connected with prescription drugs for asthma, including deaths attributed to Long acting Beta Agonist inhalers, make them intolerable for some asthma sufferers. This is where natural asthma remedies, which doctors must use to some degree with their patients, come into play to reduce or even eliminate asthma attacks. Virtually no serious side effects are attributed to natural asthma remedies and the are much less expensive. The one word that should and probably DOES come to anyone's mind when considering any treatment for asthma, is 'inflammation'. Of course this makes sense, when an asthma attack occurs, the person has difficulty breathing because his bronchial tubes are inflamed, preventing oxygen from getting into the lungs. Therefore, even natural asthma remedies must focus on reducing and more importantly, preventing inflammation. According to experts, the airways of an asthmatic are always in a chronic state of low- level inflammation, even outside of an actual asthma attack. When an irritant triggers symptoms, the inflammation is intensified. Most asthma sufferers are well aware of the environmental triggers around them and avoid them as much as possible, the list includes pet dander, bugs like cockroaches and mites, smoke, dust, vehicle exhaust and smog, fumes from chemical products including scented air fresheners, candles and incense. Besides external causes of asthma symptoms there are also internal triggers that often are overlooked. Physicians trained in conventional western medicine usually aren't taught nutritional methods to treat and prevent disease, they are taught how to treat disease with pharmaceutical medicine, which rarely gets to the root of the problem. Many asthma patients have found nearly complete relief by changing the way they eat to a healthier diet, sometimes with nutritional supplements as well. These more natural asthma remedies have often found the underlying cause of symptoms and eliminated them, many times without the need to continue taking prescription drugs. 1. Elimination diet - Many people have allergies to foods they are not aware of until they eliminate them from their diet. Some of the most common food allergens are dairy and wheat (gluten) others could be eggs, legumes or nuts. Food allergy tests from a physician aren't always accurate. Some people are tested negative for a food and still find relief when they stop eating it. Cut out each group of foods one at a time for a few weeks to find if it makes you feel better, gradually add back the foods that have no negative effect on you. 2. Paleo diet- This type of diet consists of meat, fish, vegetables and fruit but it excludes legumes, grains and dairy (common allergen foods). Because this way of eating eliminates foods more likely to trigger symptoms, many people find their symptoms disappear when they follow it. 3. Plant-based diet- two of the triggers for asthma attacks is meat and dairy, if you find after eating a meal with these foods you have a negative reaction, consider changing to a fruit and vegetable-based diet, though make sure you find alternative sources of vitamin B12 as this is only found in animal-based food (meat and dairy). 4. Avoid processed food - For many reasons everyone should avoid processed foods. They are very depleted of nutrients and many of the additives including preservatives such as sulfites and food colorings trigger allergic reactions and other negative health effects. They are also usually high in vegetable oils that contain omega-6 fatty acids which increase inflammation. Many people have eliminated asthma problems by avoiding processed foods. It is one of the most effective natural asthma remedies. 5. Cut out fast food- A study from the university of Auckland of over 3000 children ages 6-14, from more than 50 different countries showed eating fast food more than three times a week caused asthma symptoms to be worse. It's no wonder. Most fast food chains use cheaper products with the same or similar additives and unhealthy fats that trigger asthma as junk food from the grocery store. Next time you want a quick meal away from home, instead of choosing McDonald's or Burger King, opt to eat at a place like the deli at Whole Foods, where their mission is to provide healthy, organic food in a timely fashion and at a reasonable price. The cost might be a little more but the health benefits make it worth the price. 6. Go Organic - People often don't realize the effect ingesting chemical residue can have on their immune system.This is why an organic-only diet is high on the list of natural asthma remedies. A study shows pesticides can trigger and make asthma worse. Some fruits and vegetables when tested have been found with residue from more than 50 different pesticides. Some of the worst include apples, strawberries, grapes, peaches, cucumber, tomatoes spinach/lettuce and potatoes. To save money on organic fruit buy organic apples and pears in bags at places like Trader Joes. An Australian study showed a decrease in the risk of asthma in children who ate fresh, oily fish more than once a week ( canned, processed or non-oily fish didn't show the same results). Other studies showed fish oil supplements also reduced risk of asthma-related breathing problems. A study from Tel Aviv University found after a review of over 300,000 asthma patient records, those with inadequate amounts of vitamin D were 25% more likely to have had a recent asthma flare-up, showing vitamin D on the list of good natural asthma remedies. Recent research has also confirmed vitamin D plays a significant role in immune heath not just bone health, which impacts asthma sufferers since it is an auto-immune disease. The best way to get your vitamin D is to get out in the sun with enough skin exposure (no sun screen) to get a bit of a tan, a few days a week. Your body knows how to manufacture enough of the vitamin from the sun and not more than it needs. 3. Get plenty of vitamin C- Since vitamin C is one of the strongest antioxidants and anti-inflammatory vitamins, it has great potential to keep inflammation down in the lungs during an asthma flare-up. Nine studies confirm this and showed respiratory symptoms were reduced by at least 50% in some atheletes. 4. Use magnesium to relieve asthma symptoms- Magnesium works with calcium in muscle movement. Calcium causes muscles to contract while magnesium causes them to relax. Without enough magnesium, the bronchial muscles contract but don't get released, causing air flow to be restricted. Magnesium citrate is said to be the best absorbed. Putting magnesium oil on your chest can reduce the inflammation. Magesium can also lessen histamine production, often an asthma trigger. 5. Bromelain for inflammation- Bromelain has been shown in studies to be another one of the natural asthma remedies to help reduce inflammation in the lungs. It's an enzyme found naturally in pineapple but can be bought as a supplement. It may take up to thirty minutes to take effect but people have found relief from asthma symptoms using it. 1. Get regular, moderate-intensity exercise-Although exercise triggers flare-ups in many asthmatics, studies show exercise can help reduce the symptoms, as long as the exercise you choose doesn't involve sustained hard and heavy breathing, as in long-distance running. Swimming is one of the best choices because a pool setting environment includes moisture in the air which is easier for asthmatics to take in. Other good choices are yoga and brisk walking. 2. Exercise after it rains-Exercise is important for a healthy cardiovascular as well as respiratory system. . Waiting until after it rains will allow the air to be more clear of particles that could trigger a reaction, even if it isn't exercise-induced. 3. When its cold exercise indoors- Cold air often triggers asthma symptoms as does exercise so it's best not to combine the two. If you do need to go outdoors for exercise when it is cold, keep your mouth and nose covered to help keep the air you breathe warmer. 4. Do breathing exercises- Learning how to have a slower, relaxed breathing pattern through your nose rather than your mouth has helped relieve asthmatic symptoms in many who have learned these techniques. Two of them are found in the Buteyko method and in the yoga method. Both these methods help asthma sufferers, the interesting thing is the Buteyko method is shallow breathing and the yoga method is deep breathing.